It’s already been a couple of weeks since I attended and taught at the Concrete Decor Show, but it’s never to late to share a great project! I told you about it first here in this post. 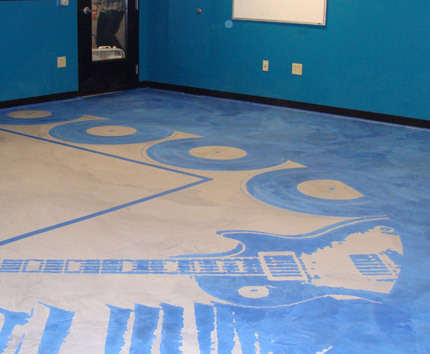 Besides teaching an 8 hour hands-on training class with Katrina Johnson from SkimStone, we left a fabulous finished floor at a very unique and deserving and thriving community center in Nashville called Rocketown. 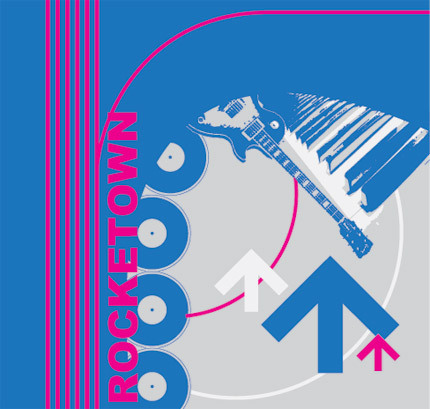 Rocketown was founded in 1994 by singer/songwriter Michael W. Smith as a place to give teens a positive alternative to the many negative pressures they face in the world these days. The first of its kind in the Southeast, Rocketown has grown into a regional outreach as well as a model for faith-based relational outreach across the country. Their goal is to lead and inspire youth through creative programs and mentoring relationships that are culturally relevant and eternally significant. Participant circumstances span the range of neglect, abuse, poverty, absent parents and normal peer pressures. 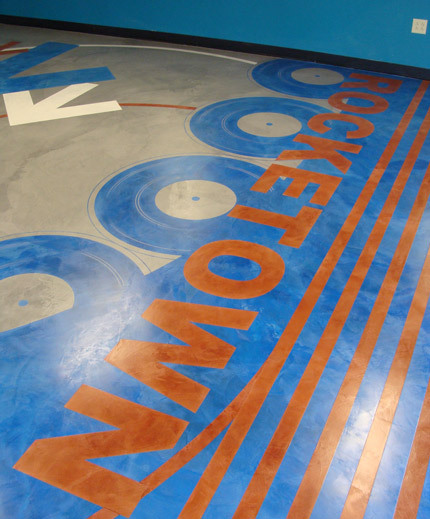 Rocketown engages local youth with a facility that houses a coffee bar; photography, art and dance, and recording studios; stages for live entertainment; and Middle Tennessee’s only indoor skate park. To date there have been more than 425,000 visits with an average of 1,350 teens from across Middle Tennessee participating in programs each week. 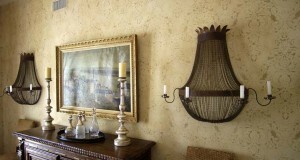 It’s quite an amazing place, and we were happy to donate our time and materials to make it even more special, along with many other decorative concrete artisans who left their art in various rooms and areas throughout. Audie Adams was one of many teens who actively participated and benefited from Rocketown’s programs and influence. A local stencil/graffiti artist, he has contributed much of the artwork that is found on the walls in the various studio rooms and offices. 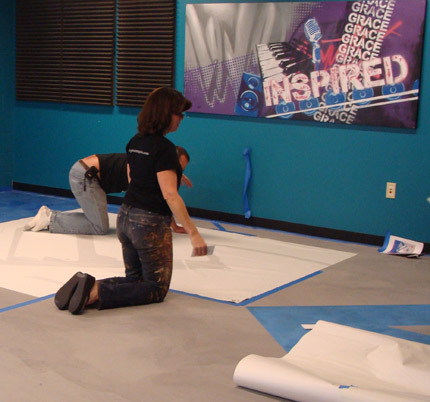 The project for Modello Designs and SkimStone was the recording studio/music room, and Audie provided the design inspiration that we adapted for the large floor graphic. I slightly simplified his original design concept to make it “doable” in two days and three layers, and Michelle did an awesome job of setting up the Modello stencil patterns in record time! 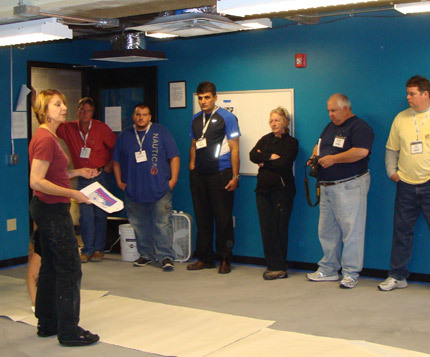 Katrina led off the class, which was a combination of hands-on and project demo, by discussing the basics of prepping for a SkimStone floor and mixing it all up. Her brother Pablo had done an awesome job of prepping the floor a couple of days early by applying a layer of their Bonding Primer over the existing finish. Katrina and Pablo then power-troweled out the first coat of gray SkimStone over the Bonding Primer basecoat while the students looked on. 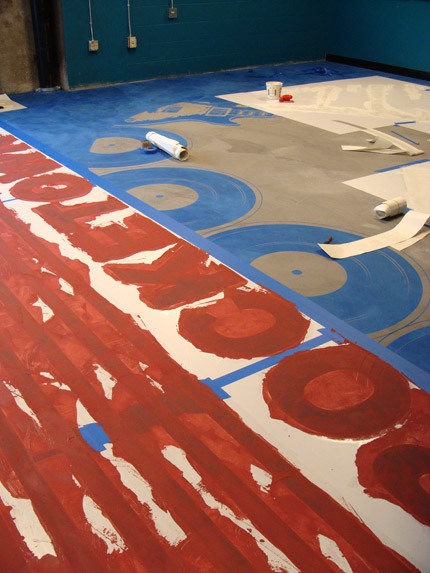 After a couple of hours drying time, I explained the design and stencil pattern process that we used and began the laying out the first layer of Modello stencils for the areas that were designated to be blue. 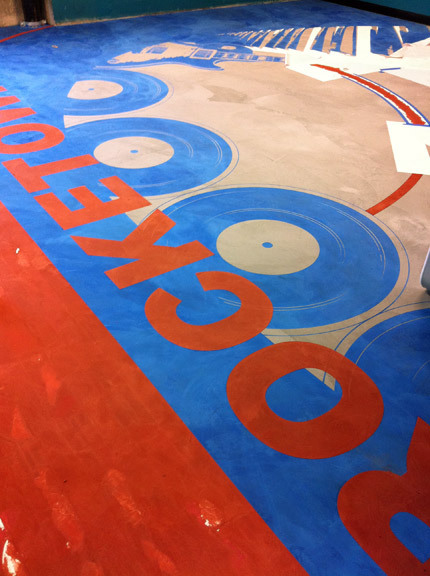 With all the vinyl stencils securely in place, we began applying an overlay of blue-tinted SkimStone. 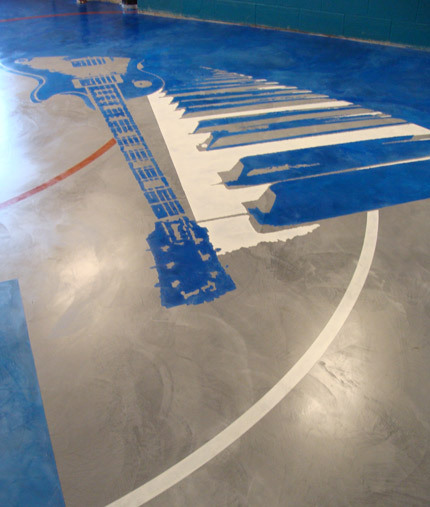 You can see the art canvas on the wall that Audie Adams created, which was the inspiration for the floor design. 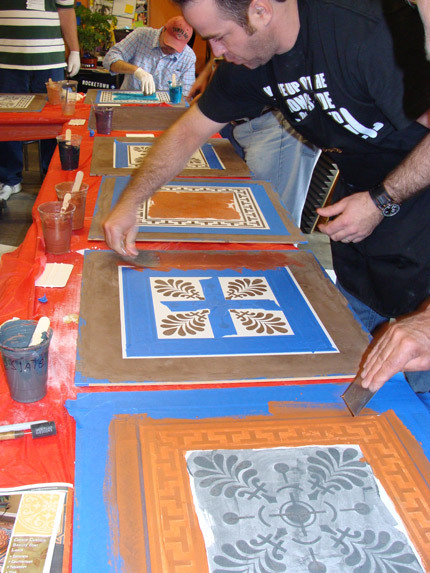 …and laid down the second layer of Modello stencils to complete the white areas of the design. 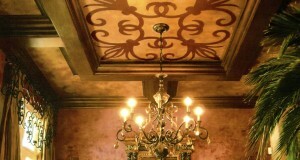 The last layer of Modello stencils added the finishing touches in bold red. 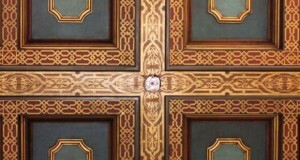 The red areas of the design overlayed right on top of the blue. Because SkimStone is an integrally colored overlay, it is possible to adjust the color to make it either opaque or translucent. We did two quick trowel layers of red for complete coverage and began removing the stencil immediately. And here is the finished floor after sealing with 4 quick coats of Penetrating Sealer the following day. Rocketown reports that everyone there is thrilled with the floor, and we were so happy to be able to leave this “gift” to them! 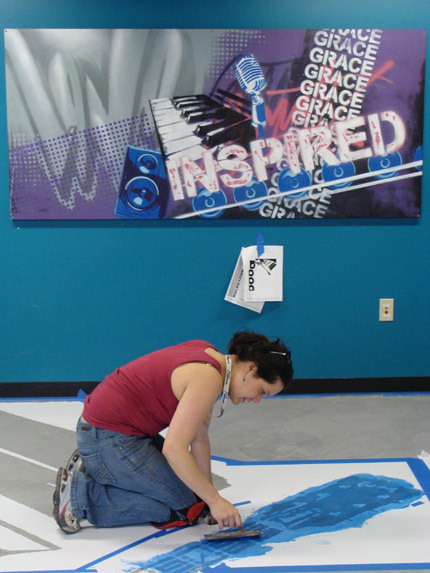 Meanwhile, as the floor was “in progress”, Katrina and I kept the students busy in the other room learning all the ins and outs of SkimStone and how to creatively incorporate Modello stencils for custom graphics and design additions. Phew! It was a very busy two days but everyone was left happy!! If you want to find out more about the Concrete Decor Show, Dana Tucker did a great overview post over on the Fauxology blog. Next year’s show will be in San Antonio, one of my favorite cities in the country of Texas! OK, that’s amazing. I love how it all came together and it’s such a gift to the kids. Kudos to Audie Adams for the great design — and thanks for mentioning Fauxology! This is just so fabulous! The design is OUTSTANDING! What a wonderful donation Melanie! LOve it! Hi! I’ѵe been rеading your site for a long time now and finally gotthe braverʏ to go aheead and give you a shout out from Huffman Tx!Just wanted to tell you қeep up the great job! Thank you for your whole work on this blog. Debby loves making time for investigations and it’s really obvious why. My partner and i learn all about the powerful mode you make effective strategies by means of your blog and as well inspire contribution from people about this article while our daughter is without question discovering a lot of things. Have fun with the remaining portion of the year. You are performing a splendid job. Today, I went to the beach with my kids. I found a sea shelland gave it to my 4 year old daughter and said “You can hear the ocean if you put this to your ear.” She put the shell to her earand screamed. There was a hermit crab inside and it pinchedher ear. She never wants to go back! LoL I know this is totally off topic but I hadto tell someone!